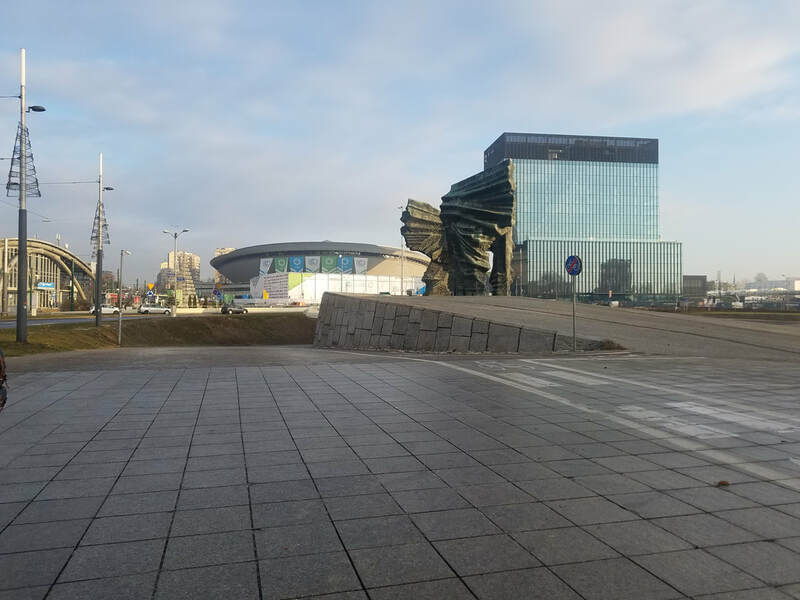 The inability of any one person to see all of the sights at the COP was never made clearer than on my last full day in Katowice. 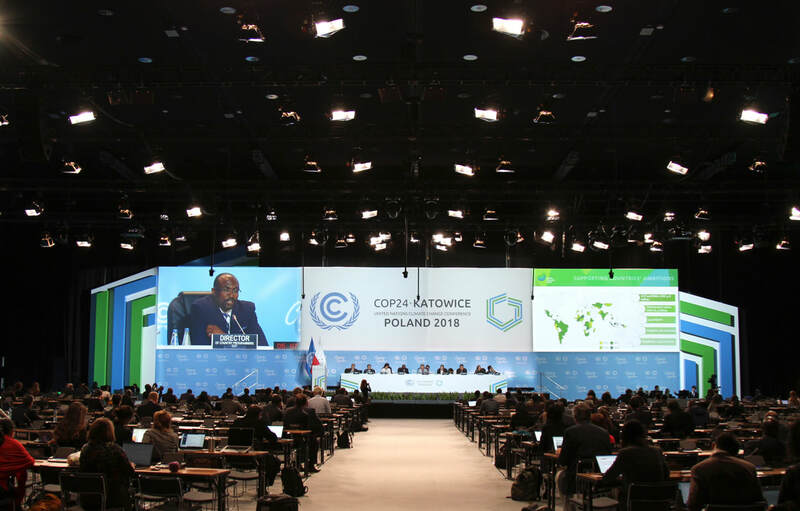 This was the concluding day of the first week of the conference, and the subsidiary bodies of the UNFCCC were rushing to complete their work before sending it off to be handled by the Parties’ ministers in the second week. As such the bodies were required to hold their last sets of informal consultations and contact group meetings in the morning and their closing plenaries in the afternoon and on into the night, able to adjourn only when the work was concluded. I left around 7:00 P.M. and wasn’t even there for the conclusion of the first of these plenaries! The tensions of the day before were amplified that morning, where I witnessed the frustration of the Parties with the co-facilitators at one of the final consultations of the SBSTA Adaptation Committee. Here, as in the APA meetings I had been attending in the days before, Parties decried the failure of the new iteration of the draft negotiating text to take into account their various views. Things started out fiery, with Uruguay (G77) immediately requesting that the group go into informal informals, given that there were provisions present in the text that were “impossible” for the negotiating group to accept. Australia and Norway agreed that this might be the only way forward, given the lack of consensus. Following this, Argentina asked for five minutes to huddle the countries of the G77 and discuss what would be required of a document hybridizing the previous iterations. And huddle they did far from my earshot, but I didn’t have to wait long before they returned to their seats and Argentina described the group’s demands, which largely consisted of specific reversions to the first iteration of the draft document. The United States quickly piped in to oppose what it saw as a rollback in progress and the addition of options it was uncomfortable with. ​This was the first of a set of stronger opposing stances that would emerge from the U.S. delegation today, which I speculate was the result of the arrival of higher-ranking State Department officials (in other words, those under closer scrutiny of the administration) to join with the career environmental policy experts who had been covering the previous days of correspondingly lower-level talks. Most of what I had seen from the U.S. negotiators prior to these shows of defiance had been a real willingness to work on the policy questions presented here, especially when such work was primarily of a technical nature. Sure, there were no outward demonstrations of great political will from the Americans, but there was also little effort to stand in the way of the first week’s negotiations, which, as my blogs may indicate, seem to be a little less dramatic than those that take place after the ministers arrive. The decision made by the co-facilitators, met with tacit approval by the Parties, was to revert to the first iteration of the draft negotiating text, with the exception of Section E (methodologies for reviewing adequacy of adaptation and support), around which the consensus was that the second iteration’s text here was fine. This allowed the text to reflect the concerns of the G77, while keeping options reflecting the diversity of views on some other controversial sections. In the afternoon, I attended the APA contact group on agenda items 3–8, which gave a summary of the progress of each of the working groups associated with the APA agenda. In general, the co-facilitators for each set of consultations, now having all been concluded, had made progress in finding solutions. Many even reached a third iteration of the draft texts being discussed. Of course, this all sounded bright and cheery before the floor was opened to the Parties to voice their plentiful concerns on an item-by-item basis. Given that the COP operates on the basis of consensus, the ability of Parties to work together to find mutually acceptable solutions is vital. Therefore, one of the goals of negotiations here is to eliminate so-called “red lines” or stances that are so strongly held as to make defying them grounds for refusal to continue discussion. As the invocation of red lines raises the possibility of Parties having conflicting red lines, killing any chance of reaching consensus, negotiators are naturally keen to avoid making anything “non-negotiable”. However, as the time for discussions came to a close on this Friday, Parties seeing their preferred language dropped from iterations of the draft conclusions resorted to stronger and stronger language. By the time of this stocktake, provisions that were previously “concerning” became “unacceptable”, stoking fears that the night of plenaries ahead would be a long one. Gabon (African Group) began the string of interventions with assertions that the agenda item 3 (mitigation, NDCs) document was “very weak” and that those resulting from agenda items 6 (global stocktake) and 7 (implementation and compliance committee) had language that made for a poor starting point for the coming ministerial talks. Things only got more heated when Saudi Arabia (Arab States) took the floor. They went straight to saying the R word and declared a red line on linking inconsistencies to compliance in the agenda item 5 (transparency framework). They also opposed the role of non-party stakeholders in participating in the global stocktake (surprise, surprise). Per usual, the remainder of the interventions here were mellow compared to that of Saudi Arabia, with Maldives (AOSIS) and Australia (Umbrella Group) keeping their suggestions labeled as “concerns” for the most part. Ethiopia (LDCs), Colombia (AILAC), and Switzerland (EIG) kept their two cents much briefer and also restrained their opinions to “should” rather than “shall” in the interest of keeping the window for unanimous agreement open. The co-chairs concluded the session with a reminder of the options which remained for the draft conclusions: identify clearly that more work is needed in sending the current texts to the COP president, revert totally to the first iterations, or forward nothing in writing. The wind whispered into the translation headset, “please not the last one”. The SBSTA 3rd plenary meeting was the last event I attended before heading back to the hotel to prepare for my return home and it was not a finale to scoff at. I couldn’t have hoped for a more dramatic series of exchanges between bona fide diplomats as my send-off from the COP. It began with a bit of comedy, as the SBSTA chair, Paul Watkinson, took his post and began to speak in his native French, prompting a great exodus of Parties and observers alike out of the plenary room as they realized they would need their translation headsets from the table outside. Refusing to be delayed, he continued on, only giving a pointed remark translated into my ears as “Yes, go get your headphones, because I will be speaking in French”. He was allowed to continue just to the point of announcing the agenda item they would be addressing, when his foil, the delegate from Saudi Arabia, rose (so to speak; he pressed his mic button) to intervene. Slow down, he pleaded, lest the chair gavel in the wrong document. The chair, patient as ever, explained which document was being dealt with in the agenda item being discussed, being sure to repeat the document symbol three times, slowly. You know, for good measure. Then, after the chair was allowed to get a couple more words out, Kuwait chimed in with a (not so fast, Brendon Urie) set of comments about the document the chair had just explained that they weren’t dealing with at the moment, and the chair once again took a deep breath and detailed exactly how he was proposing to proceed. Finally, the body was able to adopt conclusions on the Koronivia Joint Work on Agriculture, the SBSTA/SBI improved work programme, and the joint annual report of the Technology Executive Committee and the Climate Technology Centre and Network. Things were going swell until we were all reminded of how the international aviation and maritime emissions consultations had been so far derailed as to push further discussion until SBSTA 50 in June 2019. Seeking to keep things moving, he lamented the lack of agreement, but moved on to consideration of the draft conclusions regarding research and systematic observation, and this is where things got really interesting. Before half of that familiar “hearing no objections, it is so decided” could be uttered, Maldives (AOSIS) asked for the floor, suggesting that there had been no consensus on the response to the IPCC Special Report on Global Warming of 1.5 °C. This is where Parties had previously run into disagreement over whether to “welcome” the IPCC report or merely to “note” it. The text had ended up retaining the weaker language, and now Maldives scolded the lack of urgency and the refusal to accept the best available science signaled in this phrasing. The chair asked if this meant that AOSIS was proposing an amendment, which was confirmed explicitly by the delegate from Maldives. The chair then received a few dozen requests for the floor and allowed Parties to take it one by one. And one by one, twenty or so countries representing negotiating groups of more than 80 expressed firm and explicit support for the amendment to “welcome” outright the IPCC report. It was a remarkable parade of recognition for the need to act quickly and boldly to fight climate change. Of course, they hadn’t been able to reach consensus in the meeting rooms and it wouldn’t come easier at the plenary. Four countries rose in opposition to this amendment: Saudi Arabia, Russia, Kuwait, and the United States. Saudi Arabia’s intervention began with verbal guns blazing. “How exciting”, the delegate remarked about this “showdown of countries”. His sarcastic rebuke of the process continued with lamentations of how such discord over a single word meant bad news for negotiations about real substance. After noting that Saudi Arabia too could bring its own barrage of states to oppose this amendment, the delegate attempted to end the discussion on a point of order. The chair asked for objections, and AOSIS didn’t technically object, it was argued. There are no objections, so we shouldn’t be hearing views on any amendments. This parliamentary confusion was quickly dispelled when St. Kitts & Nevis took the floor to say in no unclear terms, “we object to paragraph 11” and that what was occurring before them was the UNFCCC being in opposition to welcoming a report that it invited the IPCC to prepare. The delegate from St. Kitts concluded with “If there is anything ludicrous, it is that we are not in a position to welcome this report”, which met with applause throughout the plenary room. How to proceed, the chair wondered aloud. The only option seemed to be to conduct further informal consultations until consensus could be reached, after suspending the meeting. Tuvalu asked that the chair seek the views of the plenary before this suspension and Saudi Arabia insisted that they might as well discuss the whole document now that the pandora’s box of paragraph 11 had been opened. The chair, being unallowed to continue with the agenda in the meantime suspended the plenary and for two hours or so, the plenary room was left empty while Parties attempted to iron out all of this noting/welcoming business. When the Parties resumed the plenary, it was clear from the first interventions that things hadn’t gone so well behind closed doors either. Delegates once again spoke one after the other, this time expressing disappointment about the lack of consensus and, in the words of the Swiss delegate, the politicization of this report. Cheeky as always, the Saudi delegate chimed in to ask “Did you gavel on Rule 16? I didn’t hear you gavel”, Rule 16 being the provision that ends discussion on an item in the absence of consensus. The chair thanked Saudi Arabia for its attentiveness and gaveled in the measure pushing further discussion on research and systematic observation to the next SBSTA meeting in June 2019. After several more countries reiterated their support for the work of the IPCC and their disdain for the previous proceedings, eventually the chair was able to make it on to the next item of the agenda, the draft conclusions on the Local Communities and Indigenous Peoples Platform, which passed without a hitch. Praising the success of this platform in supporting the rights of indigenous peoples and the important role of traditional knowledge in climate action, the constituency of Indigenous Peoples Organizations made a statement emphasizing the importance of urgent and rapid action on climate change. Several nations then made interventions supporting the work done throughout the conference on this agenda item and welcoming the participation of local communities in dealing with greenhouse gas emissions, which affect them with such disproportionately devastating results. It being about 7:00 P.M., I had to leave the conference at this time to debrief with the newly arrived ACS folks covering the second week of negotiations as well as to prepare for my flight in a matter of hours. Seeing as there were still the SBI and APA closing plenaries scheduled “upon completion of SBSTA plenary”, it seemed apparent that Parties would be talking into their microphones well into the wee hours of the night. This final bit of drama I was able to witness as the finale to my time at the COP, while entertaining, was disconcerting as well. How were they ever going to get a working rulebook out by the end of two weeks when multiple hours were spent arguing over the strength of a single word in one paragraph of one report of one subsidiary body? Let alone the fact that the goals these countries are working to achieve, even if met with flying colors, probably aren’t enough to prevent warming of 3.0 °C by the end of the century. Let’s not forget that the report they were arguing about described the catastrophic effects on human life occurring at half that figure. If we want to prevent the displacement of hundreds of millions, the more common occurrence of devastating storms, and the degradation of our most valued ecosystems, we cannot accept the insertion of a little more symbolic weight to our language as a success. There is no time left for bickering over red lines. There is no time for denialism or hiding behind myths of panacean market forces. There is certainly no time to entertain the idea that the rising industrial average will allow anyone but the industrialist to outrun the rising sea. I wonder how many will be able to keep their heads above water. 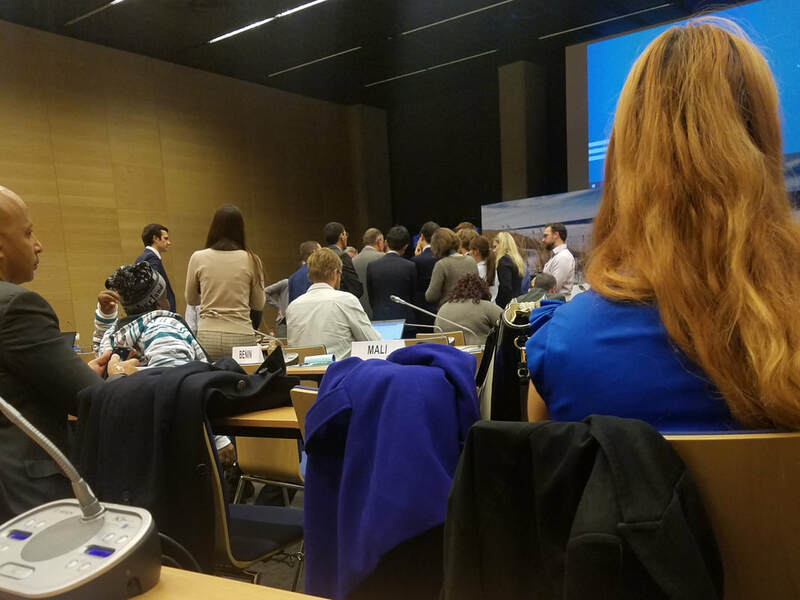 ​ The end of the first week of the COP drawing near, facilitators were becoming visibly more anxious to produce streamlined documents to present to the environmental ministers set to arrive for week two negotiations. This was evident in the sixth day’s APA agenda item 7 talks, where there was a good bit of tension between the co-facilitators who had produced a second iteration of the draft document and the Parties who weren’t too fond of it. As an attempt to move towards a “landing zone” or a document with fewer options and less bracketed texts which could get in the way of consensus further in the process, the draft conclusion was significantly slimmed down and Parties took turns berating the removal of their respective preferred sections and the general loss of balance in the representation of their views. In addition, many delegates were annoyed by the late release of this document, a mere thirty minutes before this session began. As such, few had had the chance to fully parse the document and the position of the co-facilitators was essentially “you have the room; work on finding solutions until our next meeting this afternoon”. Of course, the hour would instead be spent with the Parties asking for guidance on how to move forward (with many insisting that it simply could not done with such essential elements removed) and asking for the options in the first iteration back in the negotiating text. After each intervention, the co-facilitators attempted to calmly remind Parties of the rapidly approaching deadline for the completion of the working group’s agenda item and pleaded with them to use that time to find common ground with one another. I was unable to attend the second session of the day, but it would become clear that the effort of the co-chairs of the APA to push things forward faster met with similar pushback in the other agenda items. I attended another side event, this time at the Indonesian pavilion. Several countries and organizations operated pavilions in an area separate from most of the meeting rooms, where side events and exhibits were held to demonstrate those nations’ specific contributions to sustainability technology and climate policy. These spots were also well-populated due to the free food and merch goodies available to event attendees, like cappuccinos at France, exotic meat samples at Poland, and ornate bags and bottles of powdered ginger at Indonesia (I wasn’t just holiday shopping, okay?). The event I attended, which followed a traditional dance routine in an open area of the pavilion, was titled “Traditional Society Actions in the Changing Climate” and detailed the role of indigenous knowledge and rights in reducing domestic carbon emissions. The first speaker was Mina Susana Setra, Deputy to the Secretary General of the Indigenous People Alliance of the Archipelago-Indonesia, who explained her organization’s work in getting the Ministry of Environment and Forestry to recognize indigenous people’s customary lands. According to the ministry’s requirements for this recognition, it is estimated that 5.7 million hectares of customary forest has the potential to be recognized and this organization has worked to map out these areas and assist in the paperwork required for local governments to maneuver the process. This work was underscored by the large carbon sequestration potential from these large swaths of land and the high economic value that their ecosystem services can provide to indigenous communities given proper management. Next was Agung Wibowo, Senior Researcher at The Association of Community- and Ecology-Based Legal Transformation, who discussed frameworks for dealing with customary forest in Indonesian law. The legal system in Indonesia, in accordance with the third amendment to its constitution, recognizes adat, or the customary law of indigenous peoples within the country. This and several key constitutional court decisions have also created a process for territories and forests to be granted back to these peoples, in a process which has accelerated under the current president, Joko Widodo. In the future, this association hopes to augment the land rights of indigenous peoples by the further reform of land rights law, increased recognition of human rights within the country, and harmonization of policies affecting different sectors. Following Wibowo was Aristia H. Wanjaya, Program Manager for the IDH Sustainable Trade Initiative. If you’re curious, IDH also means Sustainable Trade Initiative, but in Dutch. This presentation focused on the various ways sustainable production and trade can benefit people economically. By assisting local communities with implementing agricultural best practices, capacity-building for production and protection of ecosystem-specific commodities, and access to markets and finance, this organization has sought to benefit the capability of these groups to grow their economic output and prosperity. In Indonesia, these efforts have focused on improving the sustainable production of mangrove honey and coconut charcoal as trade commodities and operation of ecotourism ventures. Next in line was Vadis Vik, Environmental Counselor at the Royal Norwegian Embassy in Washington, D.C., who gave a brief overview of the Indonesia-Norway REDD+ Agreement. REDD+ is perhaps the most marvelous acronym I came across at this conference, because the plus operates like Hermione Granger’s bag, holding far more words than any reasonable initialism would normally allow. The full expansion is “reducing emissions from deforestation and forest degradation and the role of conservation, sustainable management of forests and enhancement of forest carbon stocks in developing countries”. How neat is that? Anyway, this agreement provides pay-for-performance financing, that is, Norway gives Indonesia up to US$1 billion for achieving verified GHG emissions reductions. After gracefully sidestepping a question about future amendments to this agreement, she gave the floor to the final speaker of the event, Monica Tanuhandaru, Executive Director of Kemitraan: The Partnership for Governance Reform, who spoke of her group’s efforts to work with civil society organizations and government agencies to—you guessed it—reform governance. Her presentation focused on the local wisdom and traditional knowledge held by indigenous groups about preserving forests. Many villages in Indonesia depend on the forest and the services it provides for their livelihood, but have disproportionately less access to that forest and the rights pertaining to it relative to corporations and the state. This discrepancy is made that much more important by the increased vulnerability of these local communities to the effects of climate change. Social forestry efforts in the country aim to legalize access by local peoples to the forest by the issuance of management and use permits. Another major effort is to simplify regulations that pose a barrier to the return of farms to their customary claimants. Social forestry is implemented in national policy as part of Indonesia’s NDC, due to the high carbon value in forested area (deforestation would reduce in huge net emissions growth). In addition, forest upkeep provides income for poor communities and thus fits into the country’s sustainable development efforts. Social forestry also provides a platform for testing possible incentives for sustainable forest management. As an example of the successes of this program, key examples of the improvement of degraded forest by returning the land rights to indigenous peoples were presented. Further, it was shown that long-term facilitated social forestry sites have led to greater economic benefits than new forests. Recommendations from the talk included delegating parts of the permitting process to local governments to accelerate application review, formulation of a multi-stakeholder working group on social forestry to speed up development and verification of proposals, increased financial support from the central government, and stronger cooperation between different bodies within the Ministry of Environment and Forestry. As someone who went into this conference with very science-minded interests, I felt I learned a lot about the role of traditional knowledge in sustainably managing ecosystems, something rarely encountered in the academic study of environmental science. Later, at an APA stocktaking meeting, where the APA co-chairs checked up with progress on all of the discussed agenda items, I heard more of what the Parties at the APA 7 meeting had expressed earlier: the new iterations of draft proposals went too far in eliminating options. Nearly every single negotiating group went through a laundry list of issues with the work of the co-facilitators, which in their view had thrown concern for reflecting the Parties’ views out of the window. Saudi Arabia and the US went so far as to suggest that their ministers would not even participate in discussing a document that did not meet certain criteria. Even Switzerland, which expressed many of the same concerns as the co-chairs that progress was not quick enough, slipped in a couple of points about paragraphs they needed to see back in the documents. Despite the co-chairs’ best efforts at urging the Parties to be “solution-oriented”, it seemed that for the moment, such solutions were still out of reach. This second-to-last day of the first week of negotiations (and my time at the COP) seemed to be a microcosm of that charge of the IPCC Special Report on 1.5 °C, that we are almost out of time, but not yet out of time. ​Negotiations on procedures for the committee to facilitate implementation and promote compliance per the Paris Agreement continued on the fifth day of the COP, and I was able to attend another session. This session was open to observers, although between open sessions the working group had met in a number of “informal informals” or meetings totally closed to observers which are, I imagine, rather informal. Legends even tell of a mysterious “informal informal informal” consisting of a small number of delegates engaging in discussions quietly over coffee at an undisclosed location (there were so many coffee stations at the venue; it could be any of them!). Because the open meetings were only a fraction of the total meetings surrounding this agenda item, each time I came into the room, there were a few holes in my understanding of what was going on. Delegates would from time to time reference proposals made and discussions had in closed session, but overall, as long as I was looking at the current iteration of the draft documents, I was never left too lost in the woods. While the scope of this day’s meeting was broader (Sections A, B, E, F, G, and H were all fair game), the actual discussions taking place tended to focus on more minute details of the working of the committee, compared to the previous day’s proceedings. In fact, the majority of the substantive work took place within Section B, on institutional arrangements, or the legal and procedural mechanisms and agreements allowing the committee to operate effectively. The hot topics of the day included determining who shall develop the rules of procedure for the committee, which are the more detailed version of the modalities and procedures being laid out by this document. The distinction between the modalities and procedures and the rules of procedure is important, if only because Parties, seeking to avoid conflict or too much prescription (a common concern of the Canadian delegation), would often decide certain issues should be left for the rules document, which will be adopted by the larger meeting of the Parties to the Paris Agreement (CMA) at a later time. Most countries speaking on the details of the paragraph addressing the when and how of rules adoption preferred to allow the committee to develop its rules of procedure, subject to adoption by the CMA, with a general consensus, most vocally headed by Tuvalu, Argentina (representing itself, Brazil, and Uruguay—name a better trio, I’ll wait), and China, that this ought to be done by CMA 3 in 2020. Mali, representing the African Group, did express a preference that the CMA both develop and adopt the rules of procedure, but something tells me this isn’t a hill any delegation was anxious to die on. There was a wider set of views concerning the chairpersonship of the committee, which in the contemporary iteration of the text read as the committee electing from among its members two co-chairs for a term of three years, one each from a developing and a developed country. Mali (African Group) supported this as written, but Costa Rica (Independent Association of Latin America and the Caribbean) and Japan expressed the desire to remove the requirement for equity between developed and developing countries. China, known to be very mindful of the importance of this label, sought further clarification on which definition of developed country Party would be used. Australia sought to augment the clause by the addition of a requirement to elect these chairs by consensus, and the EU and Costa Rica (AILAC) both expressed a sticking preference for having a single chair along with one or two vice-chairs. What hard work the co-facilitators must have put in each day to write a text they hoped to appeal to (or disappoint) all Parties equally! The committee’s existing requirement to begin meeting at least twice a year, starting in 2020 met with urging by the EU and Australia to be amended to once per year. The EU, Argentina (Brazil and Uruguay), and Costa Rica (AILAC) also wished for these meetings to begin in 2019, so that rules of procedure could be developed and the committee could begin its work as the Paris Agreement enters into force. What an exciting (and disappointing) surge (and retreat) of ambition?! The countries were more closely split on whether the committee’s meetings would be public or private by default, with the EU and Australia supporting open meetings, Mali (African Group) and Saudi Arabia supporting closed meetings, and St. Kitts & Nevis opposing the inclusion of such a paragraph in the first place. Thank goodness everyone (Tuvalu, St. Kitts & Nevis, Costa Rica (AILAC), China, Mali (African Group), and Norway) could come together to oppose the paragraph allowing the committee to conduct its work electronically. The beauty of international cooperation truly is immeasurable. If you thought the highlights of that meeting had you on the edge of your seat, just wait until you hear about the Subsidiary Body for Scientific and Technological Advice’s (SBSTA) informal consultations on emissions from fuel used for international aviation and maritime transport. The attentive reader may note that this was the agenda item held up at the SBSTA opening plenary over whether the International Maritime Organization (IMO) and the International Civil Aviation Organization (ICAO) had actually been invited to speak or not. Well, guess what issue took up the entirety of the discussion on this item once again! The session began with Singapore raising the all-important and certainly still unanswered question of whether the draft conclusion on the floor really invites the IMO and ICAO to give their reports at SBSTA 50 in 2020. With South Africa’s insistence on the importance of getting a legal opinion, the co-facilitators sent for the UNFCCC Secretariat legal counsel once again to address the elephant in the room. In the signature caustic style of their delegate, Saudi Arabia quickly took to criticizing the trivial nature of this question and asked for its conclusion, as if it hadn’t been the entire reason for the delay in the first place. The co-facilitator denied this request, due to the apparent lack of consensus, reinforced by the EU insisting that the agenda item remain open and the US insisting that we might as well use the previous session’s draft conclusions. Indeed, while most Parties seemed to agree that the topic had been discussed enough already, their lack of agreement on which set of draft conclusions best represented this fact led, perhaps ironically, to the continuation of said discussion. The legal counsel arrived and reinforced the opinion of the SBSTA chair that there was a standing invitation for the IGOs to deliver their reports at SBSTA meetings, regardless of whether such an invitation was reiterated or not by the draft conclusion. Seeking to expedite the consensus-building process, the co-facilitator asked the Parties in the room to go into informal informals. Observers are often kicked out of the room when this begins, but not this time! Of course, as the Parties at this time spoke to one another in circles without the use of microphones, I have no idea what exactly was said, probably by design. Lo and behold, after ten or so minutes of huddling, an agreement was reached and our planet was forever saved from the scourge of unaccounted for maritime and aviation emissions. Just kidding: they couldn’t agree on which draft conclusions to adopt and so no report was produced on this agenda item, as would be lamentingly reported by the SBSTA chair at their closing plenary. Don’t worry; they’ll meet again next year. Today, I got the opportunity to really jump into the thick of things. I volunteered to attend the ticketed negotiations on APA (Paris Agreement working group) agenda item 7, which were informal consultations on procedures for the committee tasked by Article 15 of the Paris Agreement to facilitate implementation and promote compliance. Here, informal doesn’t mean the ties were any looser or the suits any less expensive, but rather that the negotiations were a little more discussion-like and a little less parliament-ish, with a group of co-facilitators preparing iterations of draft decisions for the Parties to comment on between meeting sessions. All of this may sound a little bland, but this was one of my first opportunities to get to see Parties (again, not as fun as it sounds) actually getting down to business and going over the language that could eventually make it into the final documents produced by the conference. Article 15 of the Paris Agreement deals with the mechanism that actually gets countries to follow through with their promised contributions to emissions reductions, which is important to ensuring that these goals are actually followed through with, considering the treaty is largely only as legally binding as each state wants it to be. Part of this mechanism operates through an expert-based committee which, although explicitly non-punitive, exists to help countries address issues in the way of compliance with the agreement. The exact methods available to this committee were to be discussed at these negotiations, before my very eyes! The event was ticketed, with a few tickets distributed per constituency of NGOs, largely because it was scheduled in a smaller room with less space for observers. As such, I had to present my little paper ticket in order to be let into the room, as my yellow observer badge could only get me into so many places where anything fun was happening. I hadn’t been present for some of the other meetings of this working group, but I did follow their work from this point on through my time at the conference. It is a common piece of advice given by COP veterans that in order to get a lot out of your time here, you need to pick a specific aspect of the goings-on and focus on it, since there are about ten events happening at any given time and you won’t get as much in-depth understanding if you’re just sampling around a number of topics. Indeed, everyone you have a conversation with will inevitably ask some form of “so what are you tracking?” This was the first day I really took this advice to heart, and I quickly learned the importance of this focus as Parties started referring to paragraph numbers rather than substance and I got lost in the woods without my own copy of the draft document they were discussing. Because the RINGOs constituency asks that members attending ticketed events submit notes to their website, I did have the opportunity to really get into the weeds on implementation and compliance by finding the draft document on the UNFCCC website and synthesizing the morning’s proceedings into an organized set of notes with the other two observers following this agenda item (who had significantly more expertise than I). What exactly went on in these meetings anyway? The morning session was focused around three questions that had emerged surrounding the contemporary iteration of the draft document. The first asked whether and how to combine a paragraph requiring the committee to take national capabilities and circumstances into account in identifying measures, findings, and recommendations with a paragraph that laid out other considerations including but not limited to “the legal nature of the provision”, the extent to which capacity contributed to challenges faced by the Party in implementation and compliance, the support received by developing country Parties, and the type, degree, and frequency of failure to meet the obligations laid out in the Paris Agreement. The second asked if the section of the aforementioned paragraph addressing “legal nature” would address the option of having a distinct subset of measures available to the committee specifically applicable to consideration of legally binding provisions. The third asked what specific recommendations the committee would be able to make to other bodies under the paragraph giving it the ability to do so concerning support, finance, technology, and capacity-building for developing country Parties. If you’ve ever discussed a set of three paragraphs for more than two hours, let us know in the comments! On the first question, the majority of Parties speaking up were content to allow the paragraphs to merge, but St. Kitts & Nevis, New Zealand, the US, Argentina (representing Argentina, Brazil, and Uruguay), and Australia insisted that specific language about national capabilities and circumstances be retained. Argentina, Norway, China, Costa Rica (representing the Independent Association of Latin America and the Caribbean), and Indonesia also recommended that the language be kept within the scope of the Paris Agreement. Mali (representing the African Group), Tuvalu (representing the Least Developed Countries Group), and Canada expressed preference for the paragraphs to maintain separate, although Canada’s main stance was to be less prescriptive at this stage and leave details for a later time or to the discretion of the committee. On the second question, there was significantly less discussion, with St. Kitts & Nevis and Indonesia expressing few problems with the language of the provision as is. Mali recommended that language be revised to be more in line with the Paris Agreement and the EU, Canada, China, and the US suggested leaving discretion on “legal nature” to Parties, rather than the committee. These four Parties frequently expressed concerns about the committee being given too much power to determine which provisions of the Paris Agreement were legally binding, which, they argued, would take away from the nationally determined and differentiated nature of the responsibilities afforded each state. On the third question, even fewer Parties had anything to say, and it was nearly unanimous that it was premature to discuss this item at all. At the afternoon session of these meetings, discussion turned more broadly towards the section of the document concerning initiation and process, that is, how the committee could go about discussing issues of implementation and compliance with respect to the performance of specific Parties. Here, each Party went paragraph by paragraph addressing its various concerns, and the co-facilitators called upon Parties in turn with little discussion on each item aside from prepared statements. I won’t go into the details of every paragraph (you can read the final document at the UNFCCC website) but the large part of the discussion was centered around a few important provisions. The first paragraph attracting a significant amount of attention gave guidelines for the committee’s operation, including respect for existing legal character of Paris Agreement provisions, taking account of national capabilities and circumstances as well as flexibility provided to developing country Parties, and consideration of publicly available information. Costa Rica, St. Kitts & Nevis, Mali, and China expressed special concern about this paragraph maintaining and reinforcing its reference to national capabilities and circumstances and flexibility, especially as afforded to developing countries. On the other hand, the US and Norway urged the deletion of the flexibility measure. The US and other developed countries would repeat their concern in a number of instances at the COP that flexibility measures went too far in terms of bifurcating the responsibilities shared by all countries in reducing emissions, that is, that there should be a more equal set of obligations between developed and developing countries. The provision on publicly available information was assailed as unclear and difficult to implement by China, the EU, Norway, and Saudi Arabia. In addition, the common call to keep the language closer to that of the Paris Agreement was heard from Norway and New Zealand. A number of countries also took issue with a paragraph requiring the committee to undergo preliminary examination of a Party’s written submission to verify sufficiency of the information provided, relevance to implementation and compliance, and that the submission was not “de minimis” (trivial). This examination is not present in the Paris Agreement and was thus argued to be deleted (by Mali) or clarified (by China, the EU, and the US) or streamlined (by Saudi Arabia). A subsidiary paragraph requiring the Party in question to provide responses to the committee’s questions during this examination was also criticized by numerous countries. Tuvalu and Saudi Arabia emphasized the need for further dialogue of a more facilitative nature between the committee and Party, while China and the US argued for the outright deletion of this section. As this document was still in its draft stages, some paragraphs came with a set of distinct options for a text where there was a stark lack of consensus in earlier sessions on proposed language. In one such instance of this branching, the paragraph concerning initiation of consideration of issues related to implementation and compliance by the committee met with a good deal of discussion. The options laid out here answered the question of “compliance with what?”: 1) mandatory provisions of the Paris Agreement, 2) legally binding, individual, objectively assessable obligations in the Paris Agreement, on the basis of factual information from publicly available sources, 3) obligation to communicate NDCs, to provide mandatory information, or submit a mandatory progress report, 4) a situation where inconsistencies have been found in reports as identified by technical expert review (TER). I wish I could tell you this story ended with everyone coming to a conclusion together, but that’s the kind of thing that happens in the second week, after I was already back in the States and taking my finals. No, Option 1 had its proponents in St. Kitts & Nevis, China, and Mali; Option 2 was favored by Norway and Costa Rica; Option 3 had shooters in Australia, Norway, and Kazakhstan (although each had some language recommendations); and Option 4 found its home in the hearts of Mali, Costa Rica, Tuvalu, Norway, New Zealand, and Kazakhstan. If you think you’re seeing double, it’s because some countries expressed preference for sets of options rather than just one, which seems about as useful as when everyone in your friend group doesn’t care where you’re going to eat, so you just keep asking until someone admits they only really want to go to the place that everyone else hates but look here you are for the thousandth time because nobody has the AUDACITY to suggest otherwise. …Where was I? Oh, right: Costa Rica, Tuvalu, Argentina, and St. Kitts & Nevis also wanted a paragraph deleted which required the consent of the Party for the committee to consider an issue relating to that Party’s compliance, because it would undermine the work of the committee to have to ask for permission. This would all be well and good if not for the Party which seemed to very much enjoy undermining climate action: Saudi Arabia, which insisted the paragraph be retained. But hey, that’s Hollywood, baby! In between these two sessions, I attended a side event organized by the Secretariat of the UNFCCC, titled “2050 Strategies — Planning towards a resilient and prosperous future”, which showcased the efforts of a handful of countries in developing long-term emissions reduction strategies. The first speaker on the panel was Jeanette Mani, the National Communications Project Co-Ordinator in the Climate Change and International Cooperation Division of the Ministry of Economy of Fiji. She emphasized Fiji’s leading role in global climate action, wherein it had been one of the first to ratify the Paris Agreement and submit its first NDC to the UNFCCC registry. Following in these first steps, it was also one of the first to submit its Low-Emissions Development Strategy (LEDS) for 2050, which coupled its emissions reductions to its economic development in a symbiotic way. Fiji’s LEDS consists of sector-specific plans with 5-year targets (coinciding with NDCs) and specific project information for total private-sector decarbonization by 2050. It also addresses projects for enhancing carbon sinks and promoting island resilience (Fiji is naturally one of the most vulnerable countries to sea-level rise) with options for finance and policy programs that will augment this capacity. Next was Mauro Petriccione, Director General for Climate Action in the European Commission. The EU also has rather ambitious emissions goals, with options ranging from 80% reduction to net zero by 2050, depending on domestic policy action. Petriccione emphasized the compatibility of the existing need for the EU to invest in modernization of its industrial structure and economic model with the need for decarbonization of these same processes and institutions. He addressed a number of economic positives expected to result from transitioning away from fossil fuels, including the conversion of an existing trade deficit to a surplus as imported fossil fuels are replaced with domestic renewables. The areas most important for realizing these outcomes are reduction of energy consumption, by increasing public- and private-sector energy efficiency; improved energy transmission; carbon capture and storage for residual emissions which are more difficult to eliminate; and further research and innovation in scaling up existing technologies for commercial viability. Petriccione’s report placed special emphasis on channeling finance into local use for energy-minded renovation of public works by regional branches of national governments. Addressing the domestic policy required to meet the EU’s goals, Quentin Deslot, Policy Officer for the Ministry of Ecological and Inclusive Transition in France, gave an overview of the low-carbon strategy being implemented there. It includes sections for sector-specific recommendations and carbon budgeting on the short (five years) and medium (fifteen years) terms. While the French government was in the process of revising this strategy to raise ambition to the level of the European Commission’s goals and to include a new portion of the carbon budget dedicated to sinks, the new version (now released at the time of this writing) was said to address four key pillars of environmental policy: increasing sinks (forests, agricultural lands, carbon capture and storage) sustainably, reducing non-energy emissions (from industry processes, agriculture, waste) to the capacity of sinks, decarbonizing energy production entirely, and decreasing energy consumption by 50% by 2050. Similar to Fiji, Costa Rica is also working on climate change in conjunction to its economic development efforts. Felipe De León Denegri, Advisor to the Climate Change Director in that country’s Ministry of Environment and Energy, also described a low-emission resilient development strategy, with special emphasis applied to the added word, as adaptation is a key element of facing down climate change for small island nations, which are already dealing with its negative effects. This plan incorporates a number of policy instruments to achieve the goal of sustainable development. First, the decarbonization plan is structured to reconcile the problem of misalignment in timing between NDC submission, which occurs every five years, and the production of domestic government strategic plans, which occurs with the election of new governments in Costa Rica. In addition, there is significant work on modeling efforts that accurately represent decarbonization’s synergistic and codependent effects in the energy and transport sectors. Furthermore, the Costa Rican government is building these efforts on stakeholder engagement which informs scenario-based policy-making. One key takeaway of Denegri’s presentation was that although Costa Rica has exceedingly small emissions, it brings value as a testing ground for problems that will come later in the decarbonization process. It is able to experiment with policy and determine best practices in a shorter amount of time and with smaller direct impacts. These best practices can be taken up by larger countries when they reach similar stages of climate neutrality, expediting the process and reducing failure on the broader global scale. The final presentation at this event was given by Tony Ripley of the Department for Business, Energy and Industrial Strategy of the United Kingdom. He leads on ambition issues at UNFCCC negotiations and described the UK’s work in implementing The Climate Chance Act 2008, one of the world’s first legally binding domestic emissions targets. The UK has a statutory goal of 80% emissions reductions by 2050, which is carried forth by frequent public consultation; expert review of five-year carbon budgets; annual committee reports on progress, adaptation strategies, and risk assessments; and incorporation of the best available science into review of targets. Implementation is also divided into sector-specific emission targets that aim for economy-wide decarbonization. This day’s ventures through the nitty-gritty of negotiations and policy at the domestic and international levels gave a much brighter view of climate action than we usually receive at home in the US. Other countries are setting ambitious targets and often reaching them with dedicated strategy and facilitative methods for mutual implementation. It is notable that although the US intends to withdraw from the agreement as soon as possible (a few days after the 2020 presidential election), the nation was still present in a very technical, although not political role. Indeed, we are still in for the moment, but if the IPCC report is any indication, the time for effective climate action may only consist of a few more precious moments. 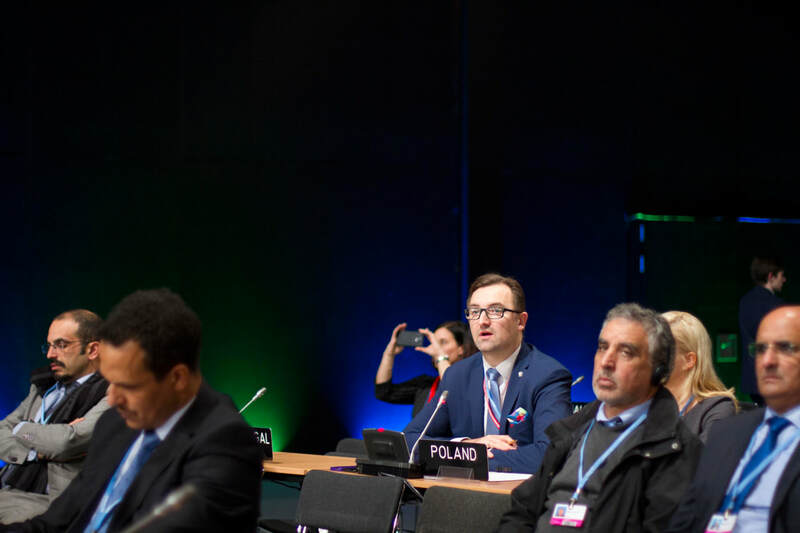 Starting on this day and continuing until the 10th, COP24 side events were organized into thematic days. The theme for December 4th was Research into Practice Day; as our delegation was sent on behalf of a scientific society, I thought I would check out how the work of researchers (and chemists, if I found any) was shaping climate policy and vice versa. I attended two side events, the first of which was titled “Inclusive energy mix – only effective way to reduce carbon emissions”. This event was organized by the European Nuclear Society and featured a panel of guests who each gave a different perspective on how nuclear energy could form a key component of efforts to make our electricity generation more sustainable. The first speaker, Valérie Faudon of the Société Française d’Énergie Nucléaire (French Nuclear Energy Society), framed nuclear energy as an efficient and cost-effective method for fighting climate change, as the technology is readily available for new plant construction and nuclear energy has a carbon intensity equal to or lower than many renewable energy sources, at around 12 g of emissions of carbon dioxide equivalent per kWh of energy produced. She also cited France’s large nuclear energy infrastructure as a reason for the country having the lowest per capita emissions in the Group of Seven (the group of countries with the seven largest advanced economies). The second speaker, Kirsty Gogan of Energy for Humanity, approached nuclear energy in a different way, proposing that it could provide developing countries with another method of delivering electricity to energy-poor areas with the advances in smaller-scale reactors. She pushed back against the proportion of energy coming from renewables as a measure of sustainability, preferring to use carbon intensity, which is more directly related to emissions. A large part of her presentation addressed the concerns of many about the high cost of building and making operational new nuclear energy plants, especially in the United States. She showed data on project completion time and cost from a number of nuclear energy projects which demonstrated that projects that were completed efficiently were neither country- nor technology-specific. Project completion time and cost relative to budget were largely a function of the use of best practices in planning and experience in building previous plants. Costs in the U.S. were therefore unusual globally and could be expected to go down as more are constructed and as more guidance is sought from nations with more established nuclear infrastructure. Gogan also touted the lower land use required for nuclear energy relative to that for wind farms and solar arrays. She finished her slideshow with a reminder that “renewables didn’t start cheap” and rather that concerted focus on technological advances and better project management allowed renewable energy to reach its current level of competitiveness. The third speaker was Hal Turton of the International Atomic Energy Agency, who gave briefer remarks on nuclear energy’s potential as a catalyst for sustainable development. He urged the need for capacity building in energy policy, in that developing countries may not have the expertise, resources, or infrastructure to successfully implement nuclear energy a)s a part of their energy mixes. The assistance of developed countries could assuage these high initial capital costs and make it easier for countries seeking such low-carbon energy sources to put them into practice as soon as possible. The next speaker, Eric G. Meyer of Generation Atomic, who — how could I forget? — began by belting a brief operatic ditty, spoke of his experiences in working with a youth-centered organization to develop energy policy. He mentioned the nuclear engineering students he had met who were getting their degrees because of their concern for climate change (and definitely not the Big Bucks™). With respect to nuclear energy itself, he too had many positive things to say about its role as a continuous energy source that could provide a background current for when renewables (in a mixed energy system) are producing low output due to their intermittent nature. The continuity of nuclear was also juxtaposed with the anticipated increased energy demand due to rising populations and reduced poverty (fingers crossed on that one) and the need to decarbonize our energy mix as fast as possible, given the new predictions of the IPCC Special Report on the rapidly approaching 1.5 °C benchmark. If only he’d sung the whole thing! The final speaker, Daniel Yi-Chiang Liu of the Japanese Atomic Industrial Forum, focused more specifically on Japan’s nuclear energy operation. Unsurprisingly, it’s not been working so well since the Fukushima-Daiichi disaster in 2011. All of the nuclear energy plants in Japan ceased operation in the aftermath of the meltdown, and each must undergo an extensive review process of several months before energy production can commence again. Only a handful have been approved so far, and the process is expected to take several years before the several dozen plants in Japan can all be fully operational once more. As a result, Japan’s Strategic Energy Plan has shifted more towards renewables although nuclear still has a place, albeit smaller. The panel discussion led to some interesting back-and-forth between the panel and the audience. As environmental NGOs run the gamut of positions on nuclear energy, which is low-carbon but environmentally catastrophic in the event of a disaster, there was some disagreement on the central premise of nuclear having an essential role in an “inclusive” energy mix. Meyer stressed that values and desired outcomes are common between pro- and anti-nuclear NGOs, and that all options must be considered, “even the ones that aren’t our personal favorites”. The panel all seemed to take on their own brand of uncomfortable when one audience member asked about the environmental and human safety threat posed by the challenge of radioactive waste disposal. Faudon responded with something of a defensive tone, emphasizing that she knew of no examples of nuclear waste hurting the population in France and citing the high degree of public trust in the government’s nuclear safety commission. There were also concerns raised about the compatibility of nuclear energy with the less-developed grid infrastructure in smaller economies. Nuclear reactors currently don’t exist in a form that produces little enough energy not to overpower grids of insufficient size, and the energy security benefits of nuclear for developing countries depends strongly on finance, capacity, and existing infrastructure. Meyer speculated that in the future, “factory-made” smaller reactors could accomplish the task of distributing nuclear energy production capacity over space for less energy-intensive communities. He also made the daring foray of attempting to address the challenge of dealing with nuclear energy in a mixed nuclear-renewable system when renewables output is high (the sun is shining and the wind is blowing). He proposed that new energy storage technologies (ooh look, chemistry!) could allow for storage of the excess energy produced, perhaps unwittingly opening his argument up to “why can’t this technology be used to solve the intermittency problem in a renewables-only system?” But don’t worry, dear reader, I’m sure they’ll finish arguing before Miami is underwater. The second side event I attended was organized by the Partnership for Observation of the Global Oceans (POGO) and An Organization for Socio-Economic Development (AOSED, because OSED was taken, I guess) and titled “Enhancing ocean/climate observing in developing nations with low-cost technology/capacity building”. Knowing full well that more slashes in the title means more fun, I took my seat near the front ready to learn! And learn I did from Mizanur Rahman Bijoy and Mohammad Mahbubur Rahman from the Network on Climate Change, Bangladesh (NCCB), as they talked about the very focused effects of climate change on small-scale salt farmers in their home country. As local salt production relies on evaporation ponds, volatile weather can hurt productivity by the redissolution of salt by unexpected rains prior to the typical monsoon season. Whereas salt farmers could once predict the onset of the rainy season with better accuracy, the increased frequency and intensity of rainfall events due to global warming and sea level rise now cause damaging losses for the amount of salt that can be harvested. Losses in productivity mean less salt to sell, bringing more of these already low-income workers into further poverty. This specific effect of climate change may seem undramatic, but the speakers argued that it is the sum of smaller effects that hurt the most people in highly specialized local economies and more attention ought to be paid by policymakers to the many and varied ancillary effects of warming. Shamim Arfeen of AOSED also honed in on climate change in Bangladesh. The country is highly vulnerable to many of climate change’s effects due to its low elevation and dependence on coastal industries like salt farming and seagoing fishing. It is estimated that by 2050, one quarter of Bangladesh could be underwater if emissions continue to grow at current rates. The presentations then shifted towards oceanic observation more broadly with the introduction of Alessandro Crise of the Instituto Nazionale di Oceanografia e di Geofisica Sperimentale (OGS), who addressed the need for greater observation of coastal waters in developing countries. One of the limiting factors, he explained, is access to user-friendly, flexible, and affordable oceanographic instrumentation. Crise leads the OpenMODs (Open Access Marine Observation Devices) project, which seeks to develop and provide such a platform with the capability of accommodating many types of sensor. In addition, the project is engaging with industrial partners through workshops to prepare for widespread implementation of these devices further in their development. Capacity in ocean and climate science was further addressed by Eva-Maria Brodte of the Alfred Wegener Institute, who emphasized the importance of education in marine science to sustainable ocean maintenance efforts. She went on to detail a program run by the Nippon Foundation and POGO to provide education and training in observational oceanography to students who undergo a ten-month intensive program. This program, the NF-POGO Centre of Excellence, provides training on scientific presentation, statistics, and experimental design, as well as specific courses in modelling, remote sensing, and ocean-atmosphere interactions. Students are also taught to use instrumentation, collect samples, and follow analytical protocols, with their studies culminating in an independent research project. And you get to be on a boat! As I was at COP24 under the auspices of the American Chemical Society and (in the words of Norman Osborn) I’m something of a scientist myself, I thoroughly enjoyed the chance to see the work of researchers take a spotlight, amid a conference largely focused on policy and language. Ah, what a luxury to be in a room where policymakers are debating how to deal with climate change, not whether it exists. Maybe someday I won’t need to leave my country to have that privilege. 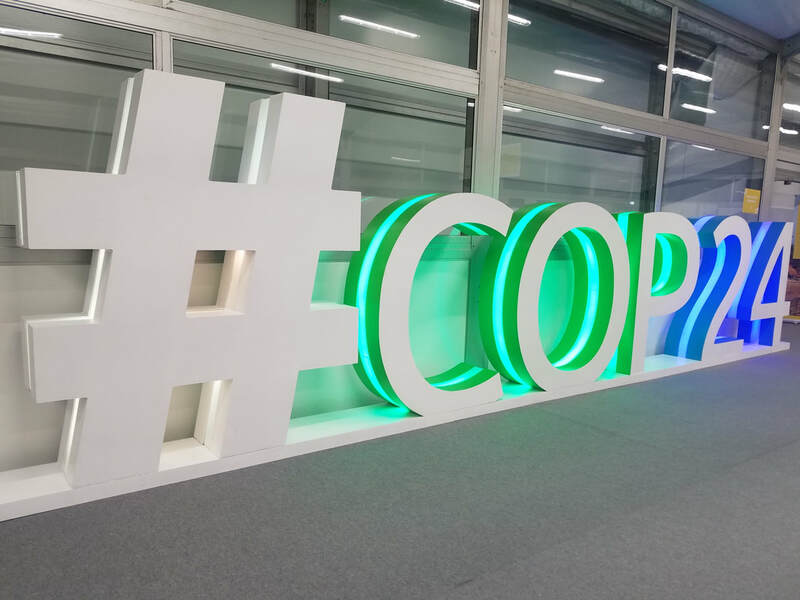 After much of the organizational work for COP24 was completed on day one, day two commenced with the official opening ceremony and high-level segment. Despite my best efforts, I was unable to get a ticket to see this event directly, as the limited number of available passes were distributed by lottery within the RINGOs constituency. But worry not, dear reader, for I was able to sit comfortably in the overflow room and view every second of the proceedings on a TV larger than the floor of my bedroom. The ceremony began with a performance by a band of alumni from a local music academy. I have been unable to find the name of this group, but let me assure you, the accordionist/vocalist fronting the group was absolutely shredding. Killer Silesian tunes aside, we were also invited to watch a video showing off the local attractions of the region, including coal mines converted into concert venues, coal mines converted into museums, and coal mines converted into conference centers for international climate summits. The theme of the mining city of Katowice undergoing a “black to green” transition would be returned to again and again to provide inspiration for the infrastructural change necessary to combat climate change. 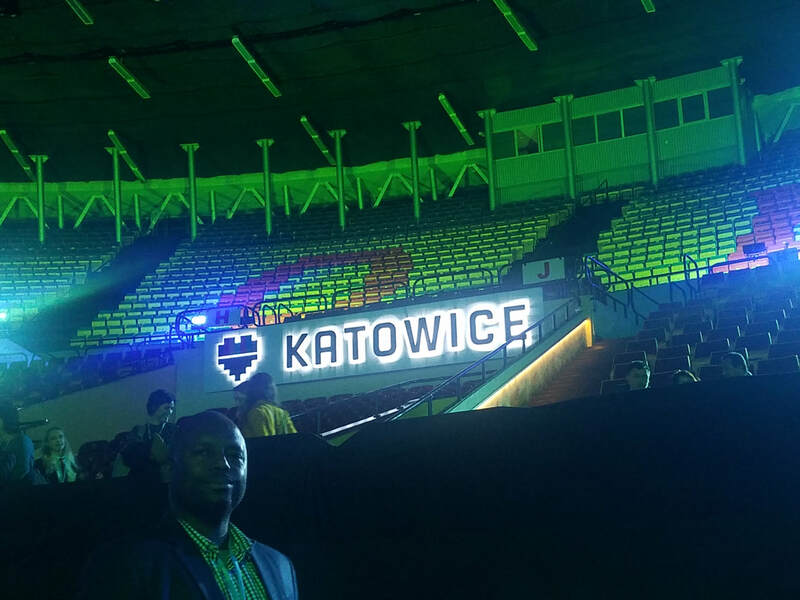 When Polish President Andrzej Duda took the stage, he would reiterate similar messages about Katowice’s remarkable movement away from fossil fuels as a primary source of economic activity, perhaps unfortunately underscored by the notably poor air quality this week in the area. The visible smokestacks in the distance and the distinct tint of coal dust in the air also served as a reminder that we have a long way to go, which is concerning considering the very limited time we have in which to prevent climate change’s worst effects. Throughout the high-level segment, heads of state and government would return to the notion presented in the IPCC Special Report on 1.5 °C that we are almost out of time, but not yet out of time to take unprecedented and focused action to reduce emissions and prevent further warming. One of the biggest voices which lent itself to this urgency was the next speaker, António Guterres, Secretary General of the UN—*swoon*. He warned that climate action ought not be seen as a burden, but as a necessary long-term investment into fighting the most important issue facing humanity, considering that if countries meet their current commitments, the planet will still reach 3 °C of warming by 2100. Net zero carbon emissions are necessary by 2050 if warming is to be kept below 1.5 °C, and the Secretary General thus called for increased ambition and political will from the leaders who would be negotiating in the coming days. Similar statements from the President of the UN General Assembly and the UN Environment Programme emphasized how behind we are if our goal is to save human lives in danger from climate change and its associated effects. The high-level segment wasn’t all doom and gloom, however. The CEO of the World Bank took the stage to announce that climate funding would increase to $200 billion over a five-year period, with funds provided by the World Bank, the International Finance Corporation, and the Multilateral Investment Guarantee Agency, which together comprise thousands of people in what must be very nice suits. President Duda also returned to propose the Silesian Declaration on Solidarity and Just Transition, a document encouraging simultaneous pursuit of climate action, economic development, and workers’ rights. The star-studded appearances wouldn’t end here. The People’s Seat initiative, which allowed people from across the world to send in digital messages about their climate change concerns to the COP, has its most popular advocate David Attenborough speak on behalf of its participants. He delivered a succinct but impassioned message of “leaders need to lead” to produce the political will necessary for decisive action, given that, according to his introduction video, two thirds of people believe that climate change is one of the most important issues facing humanity. We received another cameo during the national statements portion of the high-level segment, when the heads of state and government present for the day were to make their statements of “no more than three minutes,” according to somebody who thought this rule would receive anything more than a “yeah, whatever” from every single UN member state. In a move that may be the best reason I can think of for Austria going first, President Alexander Van der Bellen introduced the one, the only Arnold Schwarzenegger, who emphasized that despite the U.S.’ “mashugana” leadership, cities and states were still upholding their emissions reductions goals and will continue to do so regardless of their parent country’s official status per the Paris Agreement. He further drew attention to the role of local governments in reducing emissions and the need for greater platforms for local leaders on the global stage, before finishing off his speech with his characteristic promise of return (but will you be back, Arnold? Will you?). National statements from leading officials from a number of other countries followed. Countries like Nepal, Albania, Eswatini (the artist formerly known as Swaziland), Namibia and Morocco called for equitable differentiation of responsibility to be incorporated in the implementation rulebook planned for completion by the end of the conference. The national statements also primarily consisted of countries like Spain, the Netherlands, Estonia, Fiji, and Serbia defending their emissions reductions so far (to varying degrees of success) and proclaiming their planned goals for the future. A notable intervention from the Secretary of State of the Holy See addressed the issue as a moral one, rather than a technical one and urged action on the “ethical imperative” to stop climate change as a part of efforts to combat poverty and protect human dignity. Well said, Pietro! This day of the conference would be somewhat unusual, as instead of going to a handful of shorter events, I only watched the high-level segment and one other meeting: the 6th workshop of the facilitative sharing of views (FSV), where non-Annex I countries, which are largely low-income, developing countries, present their Biennial Update Reports (BURs). These reports detail national circumstances relating to emissions, including geographic, climatic, population, and economic profiles as well as sector-specific assessments of emissions past and present. Of special note in these reports are the national greenhouse gas inventory, which includes both emissions and removals of greenhouse gases (GHGs) from the atmosphere; mitigation actions; and finance, technology, and capacity needs for better reporting and improved fulfillment of NDCs. Here, I was able to hear delegates lay out the presentation form of these reports and answer questions from other parties. These sessions are less formal than the stocktake sessions where Annex I countries are required to defend their mandatory annual reports, and questions were largely clarifying and wrapped in compliments on the quality of each work. The first country to present was Argentina, which framed its domestic climate change policy in terms of its institutional basis: the National Cabinet for Climate Change, an inter-ministerial committee which defines climate changes policy and generates awareness for mitigation and adaptation efforts within the country. Argentina’s first NDC sets a target of 483 megatons of carbon dioxide equivalent net emissions by 2030. The delegation cited barriers of capacity, finance, and technology that, if overcome, would allow for even more bold action. They also noted their progress in systematizing their GHG inventory with support from the Latin American Greenhouse Gas Inventory Network. China’s BUR focused on controlling energy consumption from construction and public buildings, areas directly under the government’s control. Dealing with private sector emissions, which make up a much larger proportion of global greenhouse gas production, was largely left to China’s new national carbon trading scheme, which will allow the government to cap overall emissions by issuing a limited number of emission permits to point source polluters, which they can trade with one another or sell back to the government if they reduce emissions below their allotted limit. This system, which is similar to the emissions trading scheme used in Europe and the one very briefly considered by the U.S. Congress (maybe in a few years, sport), is still in its infancy and only implemented in a few small-scale pilot carbon markets, but is expected to fully roll out in the next decade. Finally, Jordan took the floor to discuss its own climate actions and needs. Jordan’s climate policy is implemented by its Ministry of Environment in cooperation with NGOs. They have been introducing renewables into the energy mix (of which 96% is currently imported from the surrounding region) and have set a goal of 10% of energy coming from renewable sources by 2020. Their difficulties in getting this far were attributed to lack of capacity in the form of little experience with the software and modeling systems used to generate potential greenhouse gas emissions scenarios, which make up a vital part of many of the BURs. The models used to predict climate scenario are often an object of intense scrutiny and have been crafted using the best available scientific data. They are the basis for the predictions found in the IPCC Special Report and so came up frequently during the conference as delegates were tasked with interpreting the findings of scientific organizations and converting them to sound policy. Unfortunately for all of us, these predictions have not been kind to any perceptions of victory in the climate battle. Even if every country met their NDCs as currently submitted to the UNFCCC, we would still be a fraction of the way to preventing 1.5 °C of warming, and all of the death and displacement that could result. The second day of this conference and the first real day of its proceedings saw some important first steps forward, but if we’re going to avoid catastrophe, those first steps will soon need to turn into a hurried sprint. It is crucial to work internationally in solving the crisis facing the world that needs a true leadership on global issues. The yearly climate change summits under the United Nations Framework Convention on Climate Change are great opportunities to raise climate-related issues every year and discuss the accelerating global warming in order to shape strategies to deal and respond adequately to the needs of the planet. ​The special report launched in South Korea by the Intergovernmental Panel on Climate Change (IPCC) in October this year while citing six thousand scientific references echoed the need to limit global warming to 1.5°C that could prevent some of the worst effects of climate change. And, this report is of utmost importance to most of the countries. The objective of COP24 being held in Poland’s traditional mining city of Katowice is to reach consensus of all the parties on a set of directives in the light of the Paris Accord to combat climate change. After deadly wildfire in California, climate change should have gotten more attention worldwide, but the negotiators from Saudi Arabia and the United States have allied with their Russian and Kuwaiti counterparts in startling the world representatives at the summit by demurring to a statement ‘welcoming’ the 1.5°C IPCC report. The four fossil-fuel giants argued that it was sufficient for all the parties to merely ‘note’ the findings of this report with Saudi Arabia even threatening to block the discussion if any advancements made any further in order to adopt the change of word. It should also be noted that Saudi Aramco is the world’s largest profitable oil firm. This raises one concern that if the report isn’t just ‘welcomed’ with a stronger language, how will the worldwide emissions be lowered with weaker actions to such an extent so that global warming is halted to 1.5°C by 2020. 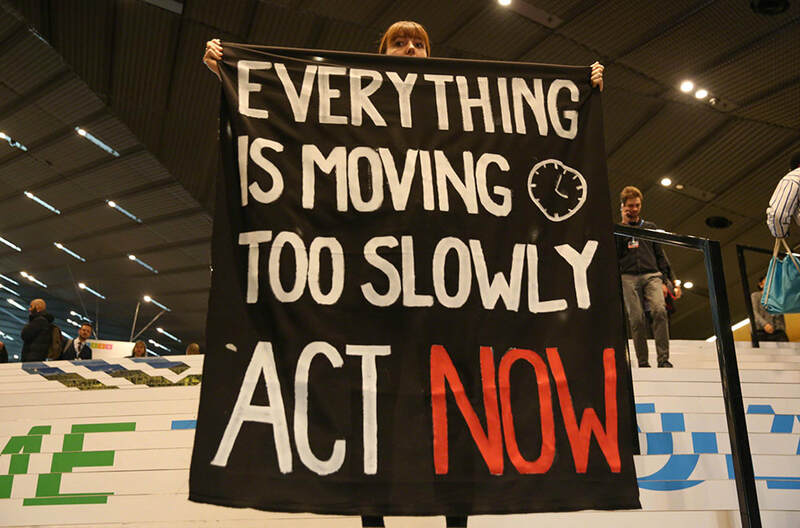 As the first week of the conference has ended, attempts at the 24th Conference of Parties have failed to recognize and adopt the 1.5°C IPCC report till now. Climate scientist, Masson-Delmotte says, “A 1.5°C and a 2°C worlds are very different in terms of mean climate, extremes, sea level rise, and climate-related risks, with the emergence of climate change hotspots challenging basic water, food, economic security and the risk of irreversible loss of wildlife.” Now, the question is how much worst we are willing to let it get, and that will the real policies and law changes ever occur. Climate change is definitely in the interests of no one and the short-term profits are more likely to cause such long-term damages that will probably leave no chances for the situation of the globe to get back to normal. Either industrial, political and ideological interests have to be compromised or the near-future of the globe. A stronger response to this global threat of warming will commence from stronger statements that will direct the world leadership towards carrying out many stronger actions simultaneously. Politicians/political leaders, senators, ministers, bureaucrats, civil servants, diplomats, and all the policy makers who deny science at the cost of the most vulnerable today will be remembered in the history for their callous actions due to their shortsightedness and complete disregard for the human lives. After two days of hopping between planes, trains, and automobiles (oh my! ), I arrived at our hotel in Tarnowskie Góry on Saturday, December 1 and slept a hearty ten hours or so. My body seemed to be preparing itself for the eat, sleep, COP schedule that the following week would bring. Surely enough, I was getting ready at 5:30 and found my way to the venue at about 8:30, where I submitted myself to TSA-esque security for another time and got my shiny new NGO (non-governmental organization) Observer badge. As I was badged with the American Chemical Society, there would be certain restrictions for my access throughout the week. Many negotiation meetings are closed to observers and certain events released a limited number of tickets for each NGO constituency. The American Chemical Society is a member of the Research and Independent NGOs constituency, so it was these meetings where tickets were distributed, by interest and then by lottery. On the first day, tickets were required for the 1st plenary meeting of the COP, which was the first event I attended thanks to the large number of tickets allotted to the constituency. At the first COP plenary meeting, after some delays, things really got moving! That movement consisted of opening, dealing with administrative and procedural matters, and then closing, but hey, it’s something. The meeting was opened by the president of COP23, Prime Minister Frank Bainimarama of Fiji, whose joviality and enthusiasm were matched only by the swiftness of his gavel in electing the COP24 President (Michał Kurtyka, State Secretary at the Polish Ministry of Energy) and adopting rules of procedure, the agenda, dates for future sessions: the works! The main goal of the first day’s plenaries was to organize work for the coming week, during which informal consultations, or meetings of parties to negotiate smaller issues with the guidance of a facilitator. These facilitators and the logistics of informal consultations and the meetings of contact groups, which coordinate linkages between related agenda items, were set at these first meetings. Informal consultations and contact groups were established for implementation, the Warsaw International Mechanism for Loss and Damage (WIM), finance, and other topics. The WIM addresses loss and damage associated with climate change’s deleterious effects and promotes implementation of approaches to mitigate them. The COPs have historically started on Mondays, but the COP24 Presidency thought it useful this year to begin with much of the administrative work the day before on December 2. Indeed, this work continued for the other bodies meeting at the Climate Change Conference. The plenary meeting immediately following was the Conference of the Parties (wait for it) serving as the meeting of the Parties to the Kyoto Protocol or CMP, for short. The Kyoto Protocol was the international treaty signed in 1997 which committed parties of the United Nations Framework Convention on Climate Change (UNFCCC) to reduce greenhouse gas emissions, specifically carbon dioxide, methane, dinitrogen monoxide, hydrofluorocarbons (HFCs), and sulfur hexafluoride. It is notable for introducing the concept of common but differentiated responsibilities (CBDR; get used to the abbreviations, it's their MO), a concept which is also vital to its successor, the Paris Agreement. CBDR acknowledges the priority that emissions reductions must be for all parties, but also recognizes differences in capacity, incorporating economic development and available resources into expectations for different countries. Capacity and capacity-building, referring to the resources and expertise made available by developed countries for use by developing nations, are a crucial part of the nationally determined nature of commitments made by parties to the Paris Agreement as well, and will feature a prominent role in negotiations at COP24. The CMP first plenary meeting also addressed largely procedural issues, but also made note of the status of the ratification of the Doha Amendment, which established a second round of targets for emissions reductions (122 countries so far of the 144 needed for it to enter into force – if you were wondering), and organized work on the Clean Development Mechanism (CDM), Joint Implementation (JI), compliance, the Adaptation Fund, among other smaller issues. The CDM allows for developing countries to receive certified emission reduction (CER) credits for projects that reduce – you guessed it – greenhouse gas emissions, which can then be traded and sold to meet targets under the Protocol. JI is another of the three flexibility mechanisms in the Protocol, in which Annex I countries (those with binding targets, consisting of industrialized countries and economies in transition) invest in projects in other Annex I countries instead of reducing emissions within their own domains. The Adaptation Fund provides financial support for projects that help developing countries deal with unmitigated effects of climate change and is funded by a 2% levy on CER credits issued for CDM projects as well as donations from Annex I countries, which has become the primary source of funding. Right near the conference center’s entrance, there was actually a large screen showing a desert landscape, which, upon donation to the Adaptation Fund by tapping your debit card to the chip reader, would transform into a lush rainforest, complete with pretty sounds and animations. Following the CMP plenary was naturally the plenary for the treaty which followed the Kyoto Protocol, the Paris Agreement, which was signed at COP21 in 2015. The Conference of the Parties serving as the meeting of the Parties to the Paris Agreement (CMA… yeah, they’re grasping for straws on this one). This plenary followed the COP approach to organization of work and election of officers, but also noted the status of ratification of the Paris Agreement, which stands at 184 countries of 195 signatories. The remaining nations were urged to expedite their domestic ratification processes, the effectiveness of such a plea remaining to be seen. A little more exciting (for the climate policy enthusiast anyway) were the first plenary meetings of the subsidiary bodies of the UNFCCC, the Subsidiary Body on Scientific and Technological Advice (SBSTA, pronounced “substah”), where the normal procedural matters were organized for work on the report of the Adaptation Committee, the report of the Executive Committee (~ExCom~) of the WIM, development and transfer of technologies, the joint annual report of the Technology ExCom and the Climate Technology Centre and Network (CTCN), research and systematic observation, the Local Communities and Indigenous Peoples Platform, the Koronivia Joint Work on Agriculture, and methodological issues relating to emissions from fuel used for international aviation and maritime transport. All of these matters proceeded fairly smoothly from first mention to lack of objection to gavel smack, as nothing was being agreed upon but for the organization of work. That is, until the last item on aviation and maritime emissions, because SBSTA was planning to hear interventions from two related intergovernmental organizations (IGOs): the International Civil Aviation Organization (ICAO) and the International Maritime Organization (IMO, a pretty good acronym). But dear writer, you may be asking, who would have a problem with these two IGOs giving their views; they were invited after all? Well, you’d be surprised, unless you were thinking of Saudi Arabia, who raised a point of order multiple times insisting that no invitation had been given at the last SBSTA session for these IGOs to deliver their statements, in what would be a series of attempts by the kingdom representing the negotiating group of the Arab States to disrupt the input of non-party stakeholders. The chair insisted, with legal support from the UNFCCC Secretariat, that such an invitation had been standing and after about 25 minutes of back-and-forth on this topic, the clearly frustrated chair finally dismissed Saudi Arabia’s concerns and allowed the two IGOs to give their three-minute interventions, which described efforts to adopt standards for measurement of global aviation and ship emissions. Little pieces of drama like this were few and far between, but certainly had me on the edge of my seat as I wondered when parties’ stances would escalate from “some concerns” to “strong reservations”. How scandalous! The day rounded off with a joint plenary meeting of the COP, CMP, CMA, SBSTA, SBI (Subsidiary Body on Implementation), and APA (Ad Hoc Working Group on the Paris Agreement). At this plenary, little business was heard other than to give the floor to countries for some introductory statements of no more than three minutes. Just kidding, pretty much everyone continued for six minutes or more, despite the chair’s minutely beeping. Here, I was introduced to many of the negotiating blocs that parties have sorted themselves into for climate talks: the Group of 77 (G77) & China, the Environmental Integrity Group (EIG), the Umbrella Group (don’t ask), the African Group, the Arab Group, the Alliance of Small Island States (AOSIS), the Least Developed Countries (LDCs), the Like-Minded Developing Countries (not LDCs), the Independent Association of Latin America and the Caribbean (AILAC), and the group of Brazil, South Africa, India, and China (BASIC), among several others. These negotiating groups often overlap but allow parties of similar interests to join together into a set of commonly agreed upon statements. This allows countries to deliver single interventions that capture the views of the group without each and every nation getting five minutes to say similar things. The interventions heard in the joint plenary seemed to represent a broad consensus on the urgency of action on climate change, especially in light of the recent Intergovernmental Panel on Climate Change (IPCC) report on the catastrophic effects of global temperature increases of only 1.5 °C above pre-industrial levels (we are at 1.0 °C now and the Paris Agreement aims to keep warming below 2.0 °C). However, their specific statements represented disparate priorities on concepts like ambition, implementation, capacity, balance, equity, flexibility, and differentiation (CBDR) and it is these differences on specific policy that could dominate informal consultations in the following days. The UNFCCC operates on a consensus basis for decision-making, meaning that all parties need to agree on a decision (or at least be satisfied enough not to object) before it can be enacted. This maximizes buy-in, but can also result in actions sufficiently diluted to please all parties. As the Paris Agreement prides itself on its universality and the concept of CBDR at least partially requires unanimous consent to comply, this consensus does help keep the treaty’s parties somewhat committed to emissions reductions, in a nationally determined form. The requirement to reach consensus is exactly why these issues are brought to informal consultations, where parties can work out draft documents and conclusions that disappoint everyone, but uniformly so. The oft-repeated theme to characterize this process is “nothing is agreed until everything is agreed” and whether anything can be agreed, we'll just have to wait and see. As the last ballots are counted and the 2018 midterm elections come to an end, it is important to reflect on the many issues which candidates used to differentiate themselves and their visions of good government. Climate change and environmental policy more broadly form a policy question over which there is increasing polarization of opinion, and as such, those running for office have used such topics to propel themselves into the spotlight as well as to disparage their opponent’s views. Senate hopefuls in particular will need to address the scientific concerns of entire states, which can have highly variable weather patterns and sources of economic activity, presenting the need for a broader and more comprehensive approach to climate policy. To explore the role of climate change on this year’s senate race, let’s look at some of the states with the most competitive races and the expected climate impacts in those regions. Increased temperatures will increase the duration, frequency, and intensity of heat waves, posing a direct threat to human health. Sea-level rise will contribute to river flooding along tributaries of the Ohio River and the Chesapeake Bay, posing an economic and health threat to communities in adjacent floodplains. Increased intensity of precipitation events and hurricane vulnerability poses a threat to infrastructure in the event of exceeded stormwater management capacity. Temperature increases, flooding, and crop timing changes may compromise agricultural productivity. Sea level rise and storm surges threaten to inundate ports at Miami, Jacksonville, and Port Everglades, three of the largest ports in the American Southeast. Increasing temperatures will produce more and higher-intensity extreme heat events, larger concentrations of airborne pollutants and allergens, and reduce crop and livestock productivity. Algae blooms, water pollution, and saltwater intrusions will threaten the availability of domestic water supplies while water demand increases due to urban development and the augmented necessity of irrigated agriculture. Higher hurricane vulnerability will threaten infrastructure and human life on an increasingly frequent basis. Increased extreme weather events pose threats to the agricultural industry by damaging crops and interfering with normal crop growth cycle timing. Damage to forest ecosystems will result in lower carbon dioxide absorption, which will reinforce a positive feedback loop for the greenhouse effect. As heat wave intensity and frequency increase, so will the public health risks, especially for the increasingly urban population of Missouri that will suffer more due to heat island effects, increased humidity, and degraded air and water quality. Increased rainfall and flooding will cause erosion along rivers and contribute to untreated sewage discharge as sewage-overflow systems become overwhelmed. Alterations in crop growth cycle timing, water loss due to increased temperature and irrigation demand, and improved ability of pests to survive the winter pose great economic threats to agricultural productivity. Energy development activities fragment landscapes, hindering adaptation of native species and degrading local ecosystems. Weather hazards like flood, drought, heat waves, and storms, including tornadoes, hurricanes, and winter storms are expected to worsen in frequency and intensity. Decreased snowpack and streamflow may reduce the surface water supply and threaten tourism to the state. Reduced crop yields may result due to higher temperature, accelerated ripening of crops, and increased competition for water. Warming and higher incidence of drought are likely to raise the risk of wildfires, potentially displacing human populations and damaging infrastructure. More prevalent extreme heat events will especially hurt the largely urban population of Nevada and may disrupt the distribution of electricity and water within cities. ​The intersection of climate science and politics forms an illustrative relationship, given the role of elected officials in supporting the interests of their constituencies as well as the highly region-specific consequences global change will have on the various ecosystems of the United States. Climate change will affect all Americans, but the localized impacts on different communities form the basis upon which the members of those groups will assess the relative benefits and risk of government action and corporate regulation. When these new and returning Senators enter the 116th United States Congress next year, we will have the chance to witness how exactly they will address (or ignore) the impending threats climate change represents to each of their communities. *As of the time of this writing, a recount is likely to be triggered in Florida’s Senate election. Region-specific climate risks were adapted from information in the 2014 National Climate Assessment (U.S. Global Change Research Program). As we have scientists on both the sides of climate change, it is essential to mention that the scientists on one of the sides that agree that climate change is real and global warming is being caused by the human activities, are more than 97% of the total climate scientists. As the scientific debates is over, the world leaders now must think of shaping a healthier and safer planet for our children and the future generations where they could live together in peace with trust, respect and mutual understanding. 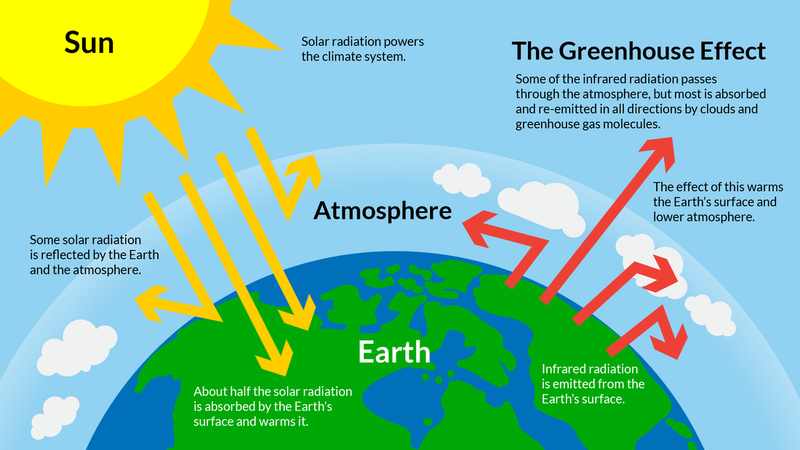 The very basic understanding of climate change comes from the study of external (climate) forcing mechanisms or anthropogenic factors that are mainly contributing to the climate change such as the ‘greenhouse effect’, which is caused a result of the emissions of gases known as greenhouse gases — the gases that absorb and radiate thermal energy. The more concentrations of such gases in the atmosphere will surely be the cause of rise in average global temperature. Also, the energy from the Sun that serves as the primary source of energy for our planet’s climate is trapped with these gases in the planet’s atmosphere that continue to radiate heat in different directions within the atmosphere and so the heat is distributed all over. Carbon dioxide is, however, the most commonly produced greenhouse gas by human activities and its emission is the major cause of global warming today. According to the European Commission, the concentration of carbon dioxide in the atmosphere has increased by 40% since the industrialization began. ​This rising temperature will not only result in heatwaves, wildfires, droughts, crop failures and diminishing Arctic ice but also the rising sea levels by melting glaciers and water expansion as the oceans get warmer leading to floods in parts of the world, and this will continue to happen if emissions keep going unchecked. It is, therefore, understandable and scientifically proven how the world is hurtling towards catastrophic environmental changes, which is why every bit of warming matters. What are the causes of rising emissions and warming apparently? There are more. Hence, climate change is a threat and will have dire consequences on the planet if the process is not slowed down or completely stopped. Corporations and industrialist elite of the world earning millions and billions of dollars from fossil fuels annually would never allow their business to be affected in anyway and therefore, will continue to disapprove the concept of climate change. Some would argue that it is not caused by the human activities, while some would argue that we just cannot do anything about it and that it is unpreventable, but the science says the otherwise. Profits being made at the cost of the survival of species by a handful of people dominating the larger planet unfortunately are aimed at destroying the planet and its environment. It is as same as the profits being made by the manufacturers of lethal and devastating weapons protecting millions of dollars instead of millions of human beings while benefiting from bloody conflicts around the world. Quite like many corporations and firms, there are states with their ruling elite refusing to compromise on their ‘interests’ and may publicly accept the climate change and its causes, but practically do little or nothing as that will affect their business. Thankfully, the historic Paris Agreement binds almost all the nations worldwide. Because, if the measures are not taken effectively today, each one will have to pay a heavy price tomorrow. It has been observed that renewable energy has produced even more jobs than fossil fuel energy in the recent past while indicating the fast-growing energy sectors. There are better and eco-friendly options available for energy production today that must replace fossil fuel rapidly with the fast transition of the world’s economy otherwise leading to environmental destruction. According to gatesnotes.com while citing UNFCCC, European Commission and UNFAO, ‘if cattle were a country, they would rank third in greenhouse gases emissions’. The heatwaves and heavy rainfalls because of such emissions also threaten the agriculture worldwide while the chemical fertilizers being employed by farmers pose triple threat for the climate. Climate-friendly farming is one sustainable way to get rid of nitrous oxide, carbon dioxide and methane with clever soil management to trap emissions. ​Let’s joins hands and act! Educate others on the matter. Force the local governments (through peaceful and organized activism) as responsible citizens and humans to act wisely for the greater good of the planet and elect such representatives who can lead their countries accordingly. The Intergovernmental Panel on Climate Change (IPCC) of the United Nations released a report earlier this month according to which ‘limiting global warming to 1.5 degrees Celsius would require rapid, far-reaching and unprecedented changes in all aspects of society’ with its full name as Global Warming of 1.5°C, an IPCC special report on the impacts of global warming of 1.5°C above pre-industrial levels and related global greenhouse gas emission pathways, in the context of strengthening the global response to the threat of climate change, sustainable development, and efforts to eradicate poverty. During the period from 1880 to 2012, the planet’s average temperature has already climbed 0.85 degrees Celsius according to the IPCC and its detrimental effects are observable in many parts of the world today. Not only the people-to-people communication, but also state-to-state communication to address climate change is the need of the time and we are already running of time.